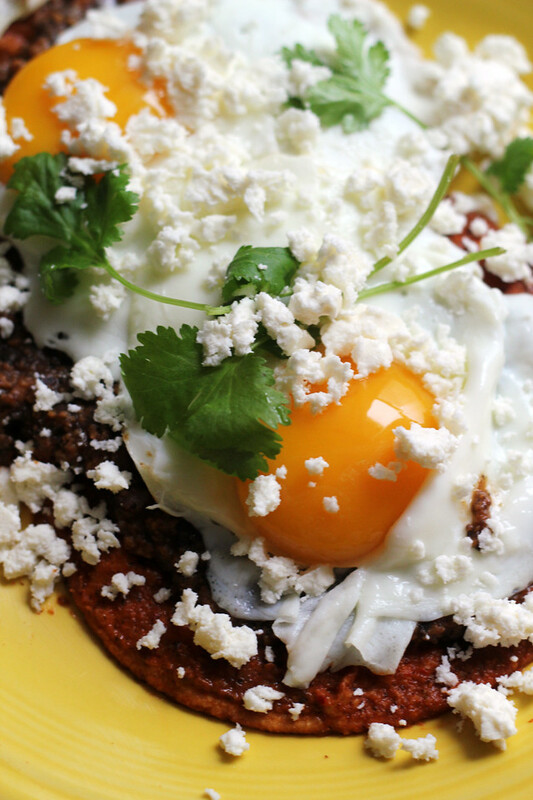 Huevos rancheros is a traditional Mexican breakfast of fried tortillas, eggs, and refried beans that we’ve spiced up with a salsa roja made from fresh and dried chiles. Let’s get one thing straight: I am not Olivia Pope. So why exactly did I think it was a good idea to save my Monday post to write after a 10 course meal…. Let’s just keep it short and sweet today. And by that, I mean, short, savory, eggy, and brunchy. So, all of my favorite things. 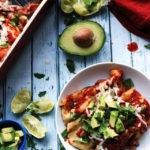 In their simplest form, huevos rancheros are basically fried eggs served on top of corn tortillas with tomato-chili sauce and, occasionally, refried beans, avocados, and Mexican rice on the side. 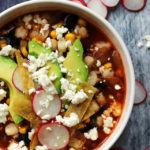 It’s the kind of thing that can be thrown together in ten minutes or less if you have some corn tortillas, a jar of salsa, a carton of eggs, and a can of refried beans at your fingertips. I’ve never been one for “simple” or “less than ten minute meals” or “making my life easier” (you may have noticed), so we are making our own salsa roja! Re-frying our own beans! NOT making our own tortillas, because I am crazy but not THAT crazy! We have a lot to do. Let’s get to it. Each of these components is actually fairly easy to make and can be made ahead. So don’t panic. 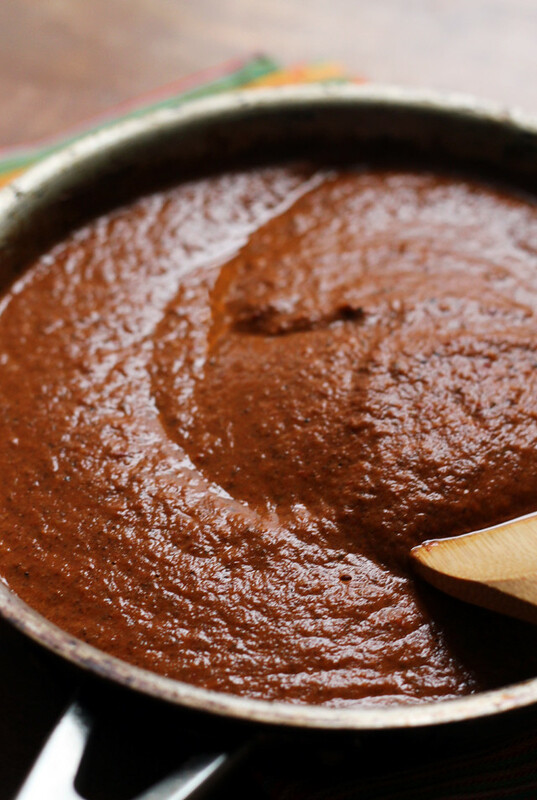 The salsa roja is smoky and spicy and has the kind of rich flavor you imagine can only come from hours of simmering, but actually just requires all of the ingredients to have a quick broil in the oven until they’re all charred and heavenly, and then an even quicker pulse in your blender. DONE. Similarly, the refried beans need a little time on the stove top (to fry the chorizo…or soyrizo, as the case may be), but after that, everything hops into your food processor and it does the work for you. Then you just need to fry your tortillas and your eggs, and you’re good to go. On that note, I have to tell you about OXO’s new line of cookware because it is blowing my egg-loving mind right now. I always struggle with making sunny side up eggs because, even if I use a nonstick skillet, something always seems to tear or fall over on itself, and I end up with a broken yolk and a plate of scrambled eggs for dinner. Which is fine. But not what I was going for. Then, I was sent one of OXO’s new non-stick pro pans to try (specifically, their Non-Stick Pro 11-inch Square Low Griddle). Nothing tore, nothing stuck, and my yolks remained FULLY INTACT until I stuck a fork in them. This awesome non-stickiness comes from a German-engineered, PFOA-free, 3 layer nonstick coating that is oven-safe up to 430F. It’s also dishwasher safe and SO easy to clean up. I’m thinking it would also be awesome for pancakes, french toast, grilled cheese, paninis…the possibilities are endless! Huevos rancheros is a traditional Mexican breakfast of fried tortillas, eggs, and refried beans that we've spiced up with a salsa roja made from fresh and dried chiles. 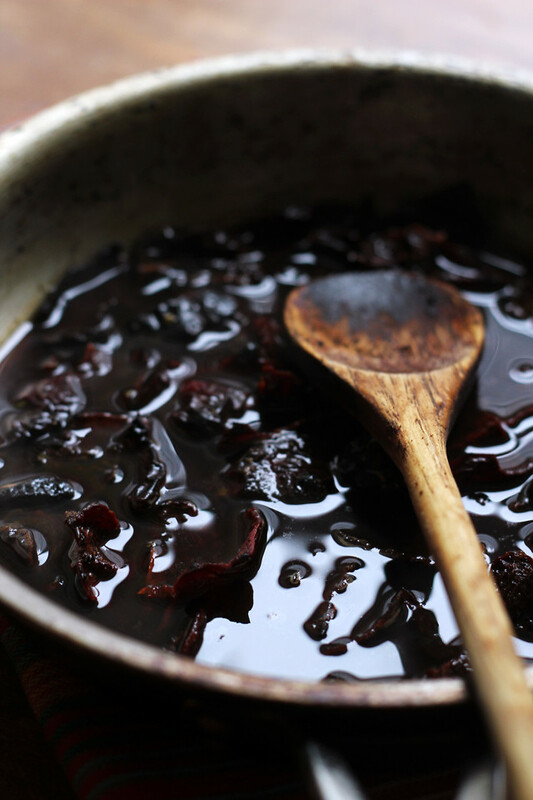 To make the salsa roja, tear the dried chiles into large pieces and toast in a dry skillet over medium heat, until they change color a bit, about 2 minutes. Add the cumin, coriander, and oregano to the pan and continue to toast for 2-3 minutes, stirring constantly. Remove from the heat and add 1 cup of hot water to the skillet. Set aside and let soak for 20 minutes. Meanwhile, preheat the broiler. Spread the tomatoes, onion, jalapeno, and garlic cloves onto a rimmed baking sheet. Drizzle with olive oil and season with salt and black pepper. Place under the broiler and broil for 5-10 minutes, or until everything is charred. Transfer the vegetables to a blender and puree. Add the chiles and their soaking liquid and puree until smooth. Return the sauce to the skillet and season with salt, black pepper, and lime juice. Set aside. To make the refried beans, heat the oil in a heavy-bottomed pot over medium heat. Add the vegetarian sausage and cook until crispy, stirring frequently, about 10 minutes. Add the onion and garlic to the pot and cook until the vegetables are slightly soft, about 5 minutes. Add the beans and broth. Simmer for 10 minutes to allow the flavors to meld. Season to taste with salt and black pepper. Use a potato masher to mash the beans into a coarse puree or puree in a food processor. Set aside. Heat 1 inch of peanut oil in a deep skillet to 375F. One at a time, carefully lower the tortillas into the hot oil and fry for 20 seconds on each side. Drain on paper towels and then dip into the salsa roja, preparing two tortillas per person. Place on a serving plate. Heat a large cast-iron skillet over medium high heat for 2 minutes. Add 1 tbsp olive oil and swirl it around, then carefully crack the eggs into the pan, 4 at a time. Cook the eggs for 4 minutes, or until the white is cooked and the yolk has just begun to set around the edges, but is still runny. Prepare 2 eggs per person. Spread the refried beans in the center of each tortilla and then top each with an egg. Sprinkle with cilantro and queso fresco. 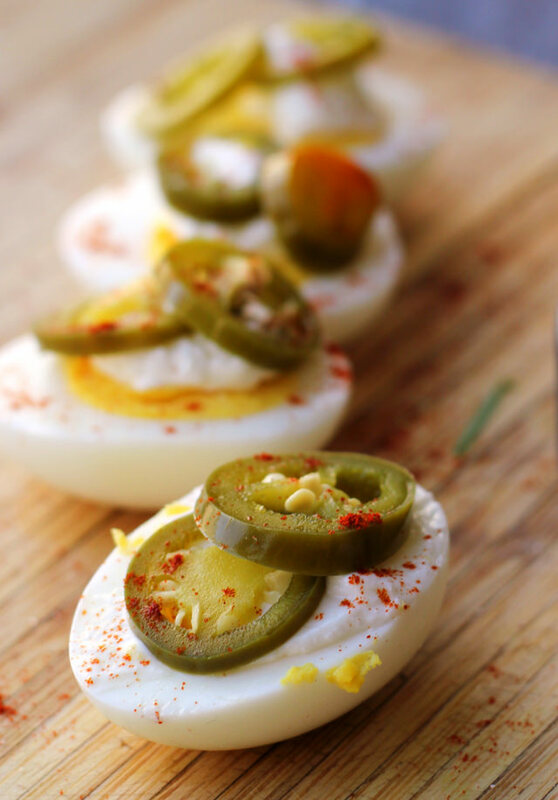 Serve with a lime wedge. Disclosure: Though, I received a piece of OXO cookware for free, I was not monetarily compensated for this post. My thoughts and opinions are my own. One of the things I’ve enjoyed the most about not being pregnant anymore is eating runny yolks again! I had missed them so much. I would adore having this for breakfast! Looks awesome in every way. Looks so hearty and delicious, just what I need for yet another morning after a snow day! I love saying ‘huevos rancheros’ all the time as though I’ve eaten it a million times when in reality, I don’t think I’ve ever had an authentic plate of it. That’s just wrong. 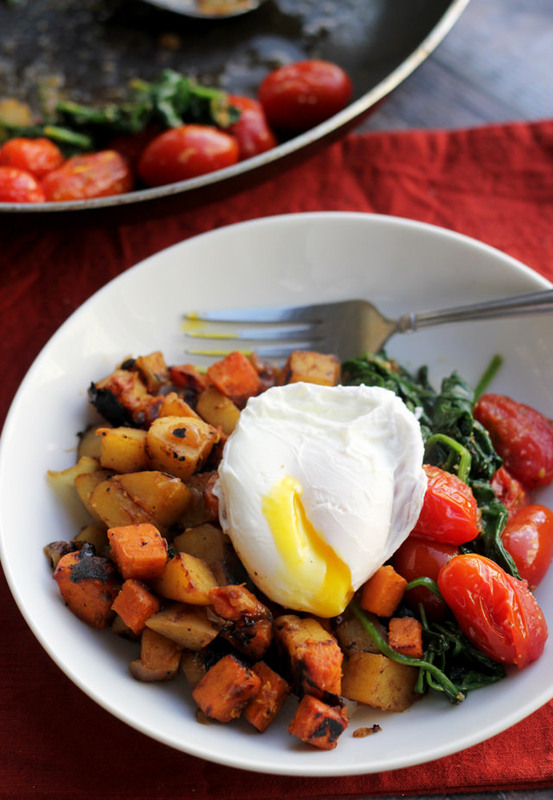 I need to make this a weekend breakfast/brunch! Just had something very similar to this over the week-end while visiting in Tucson, AZ, loved it! I LOVE huevos rancheros! 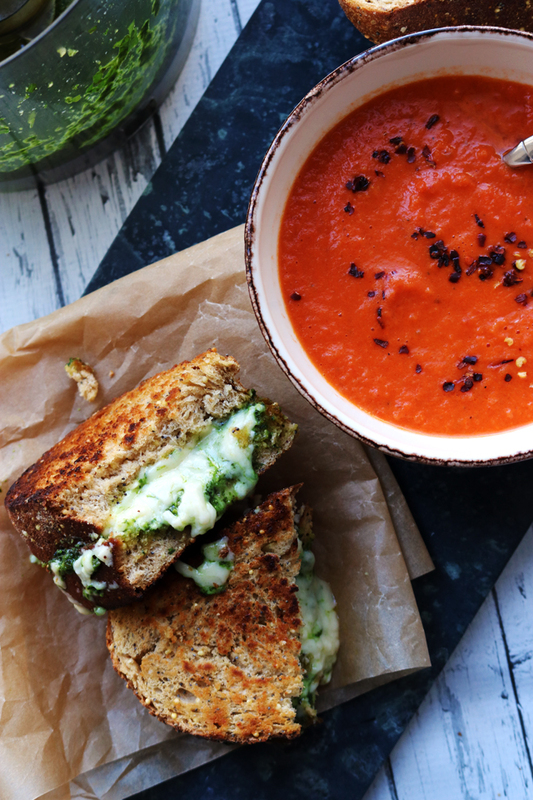 I haven’t made it in too long – time to do so with this recipe!!! Ummmm yes please! When I was in CA, they have this everywhere and it’s such a hearty breakfast! LOVE! Huevoooooos. If we ever make breakfast together, we must make this. Who cares if it takes more than 10 minutes? It’ll certainly be worth the wait! Joanne, oh my gawd girl, that salsa roja looks amazing! and your eggs are perfection! 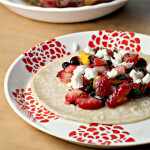 gotta check out OXO’s new cookware line. . your huevos rancheros looks fabulous! What?? You didn’t make your own tortillas?? Yeesh! 😉 this is our fav breakfast or lunch or dinner 😉 that fresh sauce is what makes the meal! This is definitely a star breakfast! I want that fresh homemade sauce!! Your photographs are so gorgeous here! I want to reach through and snag a bite. The fresh salsa sounds delightful, Joanne! That salsa roja looks AMAZING. Oh my goodness – I could drink myself out of a pool of that salsa roja! The runny egg yolk looks so SCANDALous! Okay, maybe that was as stretch, but I’m loving that salsa roja slathered all over this dish. I LOVE their non-stick line too! Just thinking about all of that wine is giving me a headache! 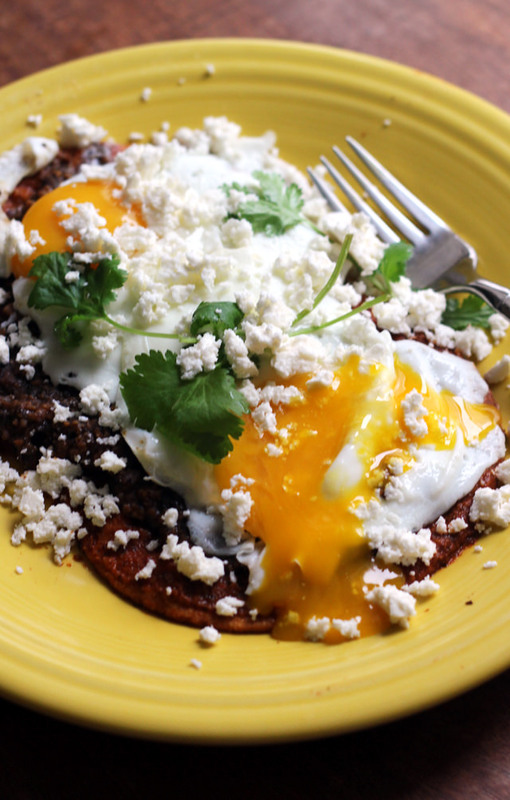 These huevos rancheros look AMAZING! Seriously. I wish I was eating this right now. All of those dried chiles makes me crave this quite a bit. I have a big jar full of about 10 different varieties that I bought in the summer last year and then dried. Love love love having a dehydrator again. Huevos rancheros is my brunch pick when I’m out, but I’ve never had the nerve to try it on my own. I’m not sure you make it look easy, but you sure make it look good. Love everything about this, Joanne!! 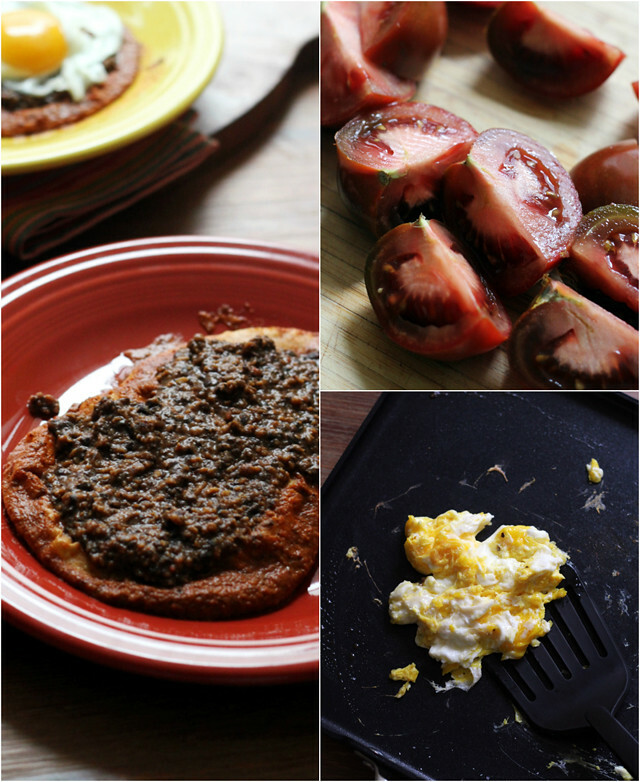 I love huevos rancheros – have you ever tried it with polenta as the base? 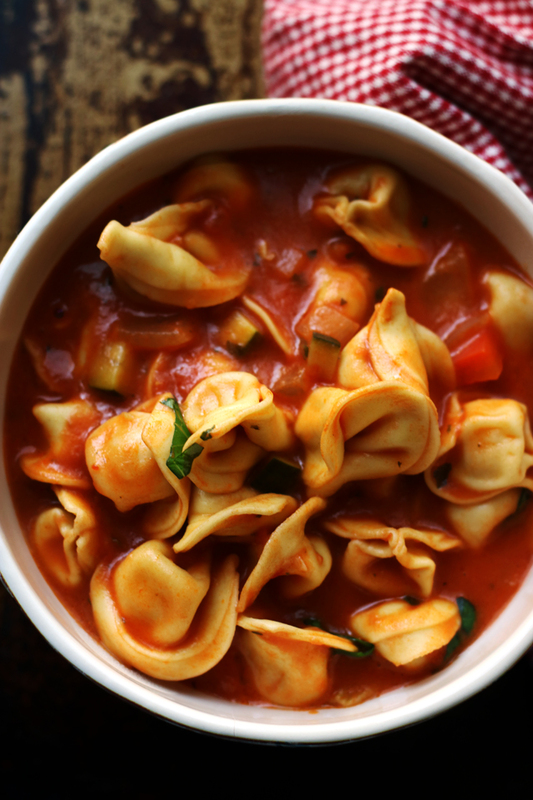 Kind of an Italian twist on it, super good. Can’t wait to try this! Woo hoo! 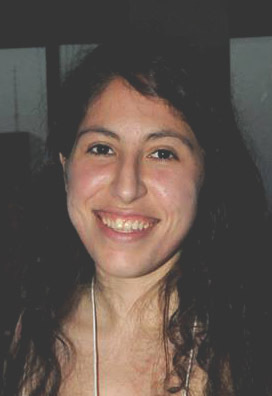 Way to go, Joanne! 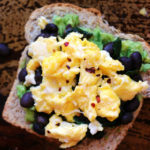 Love those eggs and all the goodness with them! I’d love to dive right into it all immediately. Yum! There is nothing better than a perfectly cooked egg! What a great way to start or end the day. Those eggs look SERIOUSLY perfect!! 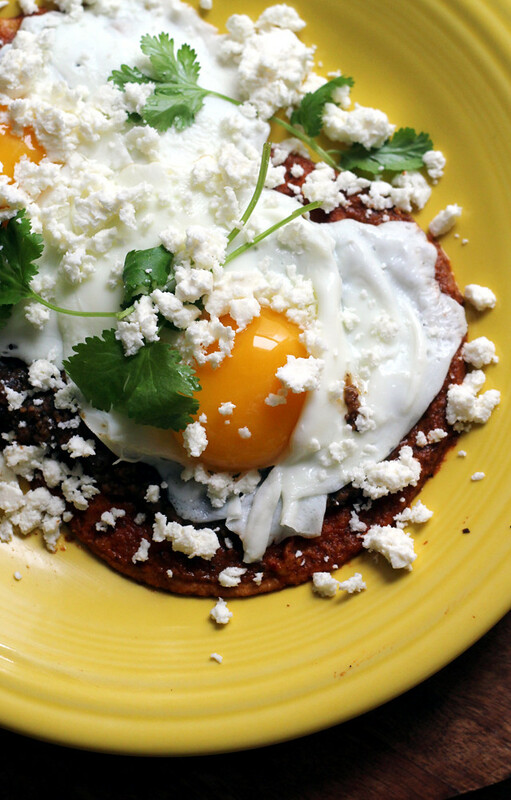 i love huevos rancheros, and i must say that your egg game is on point, ma’am. hope that you had fun in disney! Huevos Rancheros are some of my favorite huevos 🙂 Yours look absolutely perfect! I love the richness of the sauce. Hope you’re having a blast at Disney! Sadly (and -maybe- for the sake of my sanity) I don’t have all the ingredients at hand… yet I’m tempted to nag a Spanish friend of mine, who said he would cook tortilla for me, to do these for me instead – soon! – they look absolutely tempting. Wonderful photos and recipe. I love, love, love sunny side up eggs and would suffer withdrawal if my pan turned them into scrambled! Really like the new griddle pan you received. I love the refried beans with the egg. Looks delicious. I love Huevos Rancheros and your Salsa roja is amazing!!! Mmm! I used to order this dish when I eat brunch at a restaurant by my old apartment in DC. It brings back yummy memories of brunch (haven’t found anything close in the west coast yet!). Thanks for the recipe, can’t wait to recreate some huevos rancheros good memories! Just right for a hearty breakfast with your special salsa and refried beans you will still make room for it even after that ten course meal! I cannot get enough eggs! This is not a phase – it’s been going on for years! I’ve never had Huevos Rancheros, it looks super tasty. Can’t wait to try it!! Yuuum! 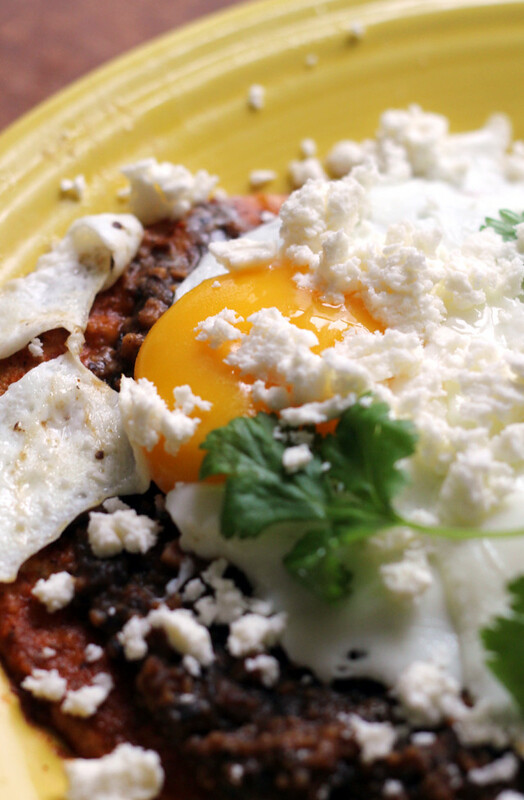 I love huevos rancheros, especially because I love beans with anything and everything! Simple and delicious. Your salsa roja looks fabulous! Yum yum! 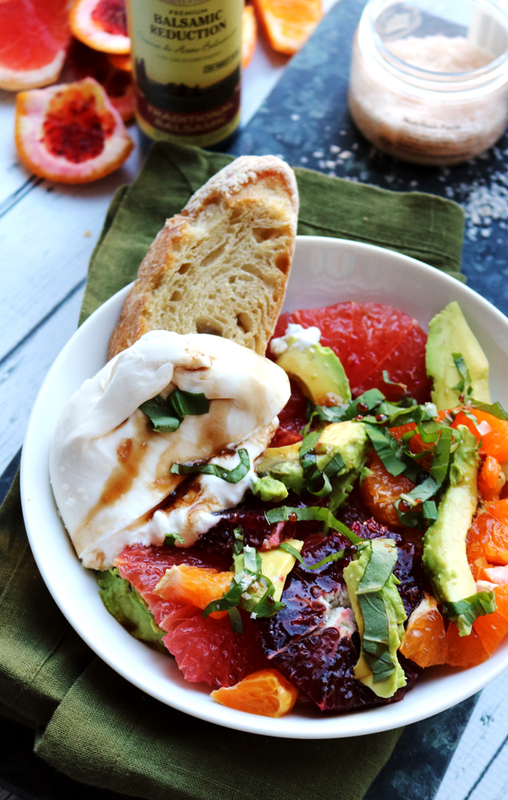 This is a delicious dish for any meal of the day! I can’t believe I have never had these! They look divine! So happy to have your recipe! Thank you!! I kind of want this every day. And yes you are a little crazy, but I love you for it! Goodness, this salsa roja looks absolutely incredible! Those eggs are cooked perfectly! I am so wishing this plate was in front of me right now! Just gorgeous! This is my go to breakfast when I see it on a menu at a restaurant. Yours looks FANTASTIC! I love OXO’s products – haven’t met one I didn’t like. Chilaquiles will always be my #1 breakfast food, but huevos rancheros are an extremely close second. The salsa sounds perfect. Oh, this is so my kind of dish – Joanne! 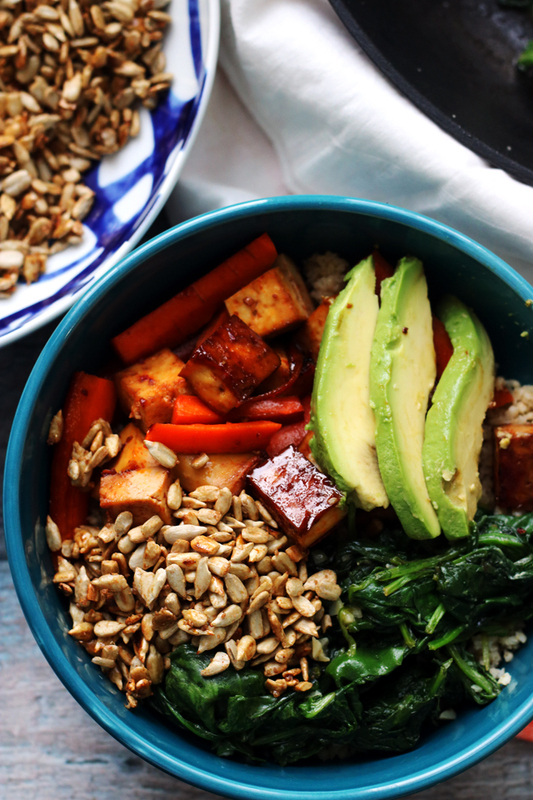 I’m so intrigued by this amazing meal you ate – I’m eating something similar tonight! 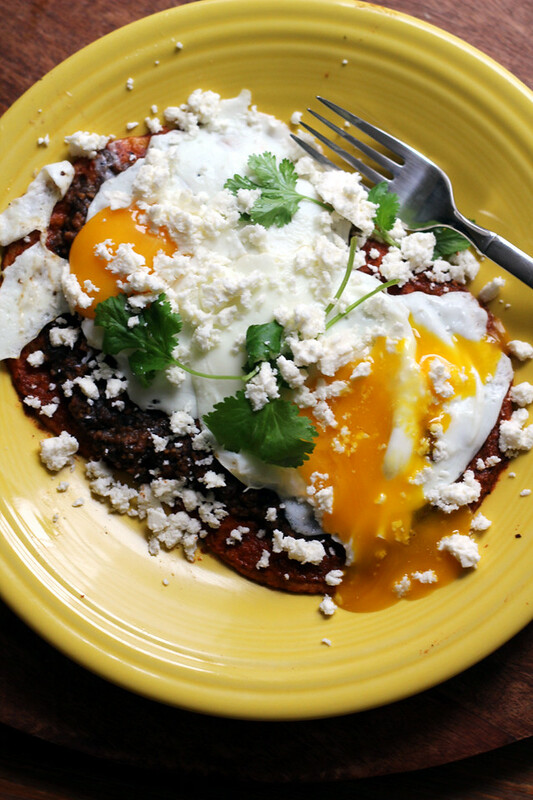 Huevos rancheros are the best weekend brunch food! I love that beautiful salsa too — so rich and delightful. while i’ve never made huevos rancheros at home, it’s something i really like to order for brunch at a local restaurant–they do it better than i ever could! 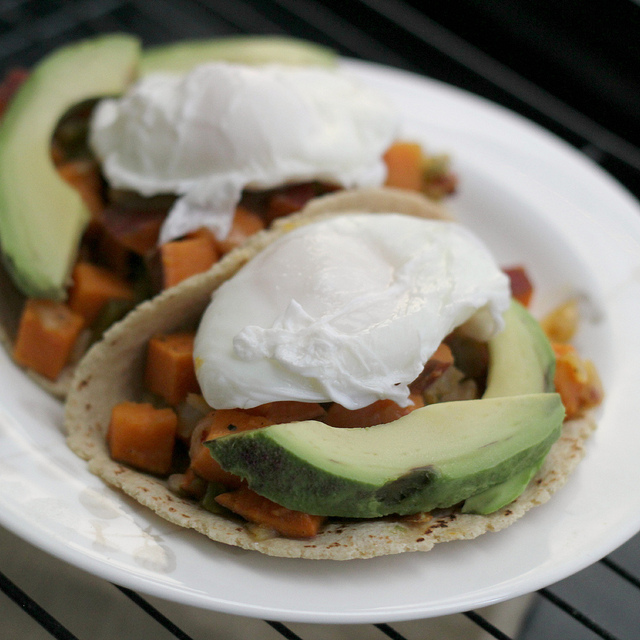 I’ve never tried huevos rancheros before.. but after seeing this I definitely am inspired to make it. Looks so rich with flavour and spice! Yum! Now that’s what I call a breakfast!